David Berliner’s (2000) list of a dozen criticisms levelled against teacher education struck a real nerve in me. I was not at all surprised by the volume of grievances or by the nature of their complaints: they are all “quite familiar” as Berliner himself points out. But I realized as I scanned these critiques about “Mickey Mouse” coursework and the futility of preparing people for a job that “any reasonably smart person can do” (Berliner, 2000, p. 358) that I hadn’t absorbed these assumptions from a suspicious general public. Quite the opposite, in fact, most of the people I know who aren’t teachers tell me regularly that they could never imagine being one. “I don’t know how you do it,” they often say. Instead, these critiques sounded like the grievances of my colleagues. I heard many of them before I’d even started my initial teacher training at OISE, and most often from graduates of it or a similar program. I heard them aired by a number of my fellow teachers in training, especially those who couldn’t wait to get into the “real world” of practice. I hear them even more often now in the hallways and in the staff and work rooms of the schools where I’ve taught since I graduated six years ago. Why are many of us so quick, I wonder, to throw our pre-service education under the bus? I am just as guilty, at times, of bashing my own teacher education. Despite promoting itself as an integrated program, my Bachelor of Education at OISE at times felt like anything but. My cohort was bound more or less by common interests—I belonged to the “Global Education” cohort in the intermediate-senior panel—but my coursework, at times, felt disjointed in both content and pedagogy. While I was practicing inquiry-based learning in my social sciences methods course, for example, I was being drilled by weekly multiple-choice tests about stages of adolescent development in my psychology course. The program had something of a collective vision, to borrow Kennedy’s (2006) terms, but there appeared to be disagreement among my professors about the way to enact that vision. My practica felt even more disconnected, as though my placements had been last resorts (they were) instead of intentionally selected to meet my needs as a teacher candidate and the program’s own aims. By the end of the first week of my first practice teaching placement, my associate teacher, who was often mapping out football plays in the back of the room while “observing” my lessons, had taken to leaving shortly after the bell for a coffee run. The massive windows of that first classroom overlooked the parking lot below, and I would watch as his car pulled out of the lot and drove silently away while his twenty or so Grade 10 English students, most of them half-asleep, waited for me to do whatever it is that a teacher is meant to do. These grievances, to be sure, weigh heavily as I reflect on my time in that program, just as the criticisms Berliner identifies carry substantial weight in conversations about what it is that teachers ought to learn and how they should learn it. However, what I find troubling about mine and others’ tendency to bash our own pre-service education is that it often rests on a flawed understanding of learning, and one that ultimately underestimates teachers’ own capacity as knowers and narrowly defines “practice” as the thing that happens between teachers and students in the classroom. If teaching does involve upwards of six distinguishable and simultaneously enacted areas of concern, as Kennedy (2006) has it, then perhaps we are asking too much of our pre-service programs. Or perhaps, since one of our profession’s hallmarks is the “abruptness with which full responsibility is assumed” (Lortie, 1975, p. 59), we are expecting too much too soon. I want to work against my own knee-jerk tendency to bash my pre-service education and do something I haven’t done as often: reflect on what it did offer me rather than what it didn’t. First a slight detour. One of the most important lessons I learned during my undergraduate degree is that writing well involves taking risks and making mistakes. The professor who taught my fourth-year seminar in social movements explained this by way of analogy: approach writing, she told us, as though you are a potter. A potter puts a slab of clay on the potting wheel, and uses her hands to mould and remould the clay until she’s created something that satisfies her. 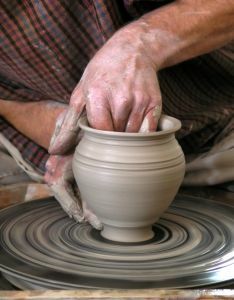 At any time, the potter can remove the clay, roll it in her hands, and start again. A jeweller, on the other hand, who is cutting a diamond for a ring or a necklace, has only one chance to make the perfect incision or else he renders the stone worthless. Writers, she insisted, are under no such obligation: they can do as the potter does, working and reworking what they’ve written until they’re satisfied. I understood exactly what my professor was explaining—so much so that I now share this analogy regularly with my own students—but it’s only recently that I think I may have “learned” this lesson for myself. Or rather, more accurately, it’s only recently that I’ve begun learning this lesson in practice. I share this analogy, and my “learning” of it, for two reasons. On one hand, it reminds me that learning is not a simple transaction: that we never simply or immediately “apply” what is “learned”—that learning is not about making deposits which we later cash in. I am still very much learning what I portended to have “learned” as a teacher candidate, just as I am still learning to be a potter rather than a diamond cutter. I “learned”, for example, about inquiry-based learning, about student-centred curriculum, about the importance of community and citizenship education to nurture the whole student—all the trademarks of the teacher education collective vision, really (Kennedy, 2006). But learning, for me, is not teleological—there is no fixed or obvious endpoint at which something is definitively “learned”. Standard curricula assume the opposite and posit that a clear destination is not only in sight, but that it can be reached within a bounded timeframe given the right sort of interventions. I don’t think of learning that way, and so why should I hold my pre-service training against these criteria? The potter analogy is also instructive to me because I like to think I approach teaching in much the same way—as a process of working and reworking—and I do this because that is what I learned about teaching, in obvious and subtle ways, at OISE. My instructors here—particularly in the so-called “Mickey Mouse” methods courses—actually did what Loughran (2006) proposes: they invited us to “see into teaching” by giving us “access to the thoughts and actions that shape[d] their practice” as teacher educators (p. 5). When my social science methods instructor had us developing units of study, for example, she used an inquiry-based model that began with us musing on the purposes of social science education in the first place, and then reading the formal curriculum vis-à-vis our own images of what social science teaching and learning ought to entail. We threaded our own ways of knowing with curricular ways of knowing to develop lesson plans that resonated with and expanded our own values and experiences. Meanwhile she explained the pedagogical choices on her part—the sequencing, the purposeful arrangement of small groups, and so forth—and invited us to reflect on their efficacy for our own learning. I wasn’t cognizant at the time of the many layers enacted in this seemingly simple task of unit planning. Or rather, although I knew my instructor had intentionally designed the experience with several layers in mind (she told us as much), it’s really only now, with a few years of being in the classroom behind me, that I’ve begun to understand how it and similar experiences prepared me for teaching in ways that I underestimated. It’s not just that my instructor “modelled” inquiry-based learning, or constructivist approaches, or whatever arm of the teacher education collective vision (Kennedy, 2006) such an exercise evokes, it’s that she positioned us, teachers-in-the-waiting, as knowers and doers. None of us had stepped into a classroom yet—we were not “practicing” in the traditional sense—but I believe, in retrospect, that we were in fact already “learning-by-doing” (Lortie, 1975). By weighing in on her decisions, by pottering with her, I feel that we were already “practicing” what teaching entails. Kennedy (2006) is suspicious of any teacher education program that “lacks a repertoire of habits and rules of thumb” (p. 209). I could easily concur that my program left me woefully underprepared because I left with few practical ways of “doing” teaching. Sure, much of what I did “learn” was front-loaded, and perhaps necessarily so, but as Loughran (2006) suggests, it requires a different sort of energy “for students of teaching to shake themselves out of their well-established comfort zone of (perhaps passive) learning and to begin to question the taken for granted in their learning about teaching” (p. 4). I am resisting these critiques of “front-loading” and dumbed-down curricula because they posit, in the first place, that teacher education is merely preparation for practice and not a kind of practice in itself. Perhaps the greatest single strength of my pre-service education—and the rule of thumb that has sustained me in my career so far—is that it resisted this notion: it forced me to be a potter. Moulding, remoulding and shaping is what I continue to do. Berliner, D.C. (2000). A personal response to those who bash teacher education. Journal of Teacher Education, 51(5), 358-371. Kennedy, M.M. (2006). Knowledge and vision in teaching. Journal of Teacher Education, 57(3), 205-211. Lortie, D. (1975). The limits of socialization. In Schoolteacher. Chicago: University of Chicago Press. Loughran, J. (2006). Introduction: Developing a pedagogy of teacher education—What does that really mean? In Developing a Pedagogy of Teacher Education (1-10). New York: Routledge.